See our live notes from today’s Google Buzz event here. Google has a problem. Despite having their hands in just about everything online, they’ve never been able to tackle what is a key part of the fabric of the web: social. Yes, they have Orkut and OpenSocial, but no one actually uses them. Okay, some people use them, but not in the meaningful social ways that people use Facebook or even Twitter. Today, Google may have just solved their social problem. Google Buzz is easily the company’s boldest attempt yet to build a social network. Imagine taking elements of Twitter, Yammer, Foursquare, Yelp, and other social services, and shoving them together into one package. Now imagine covering that package in a layer that looks a lot like FriendFeed. Now imagine shoving that package inside of Gmail. That’s Buzz. If Google Wave is the future, Google Buzz is the present. FriendFeed Reborn. On Growth Hormone. 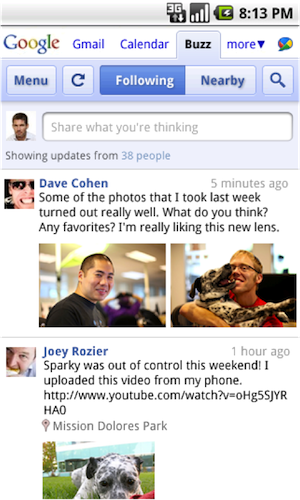 Fundamentally, Buzz is a stream of status updates, pictures, links, and videos from your friends. You can “like” these items and you can comment on them. And if you use Flickr, Picasa, Google Reader, or Twitter, you can also automatically have those items imported into your stream. And Buzz will recommend items you might like based on your friends’ activity. Yes, again, it sounds a lot like FriendFeed. But it has a critical component that FriendFeed never had prior to its acquisition by Facebook: a massive installed user base. Maybe you missed the key bit of wording above: it resides inside of Gmail. Rather than trying to build its own new social service from scratch, Google is making Buzz a key part of their email service (right below the Inbox tab) that 176 million unique visitors each month, according to comScore. Buzz also wants to differentiate itself another way: social curation. As Mike wrote about the other night, the social web right now is largely a mess. There’s simply too much going on, and no one is really working to sort it all out. Google is trying to do that with Buzz by allowing you to import items from services like Twitter, but only show you the best ones. For example, Google says it will hide quick messages like “brb.” The plan is to also auto-collapse items that don’t have a lot of comment activity. For now, this data is sadly only a one-way street. That is to say, you won’t be able to update your Twitter account from Google Buzz, we’re told. But Google seems to be indicating that this functionality will be included eventually, and that overall they’d like the product to be as open as possible. And yes, there will be plenty of APIs. But one company noticeably absent from all this talk of importing and exporting data is the 800-pound social gorilla in the room: Facebook. Listening to Google tell it, you’d almost think Buzz is just as much of a mobile product, as a social tool inside Gmail. And it just may be. Google is heavily touting the ability to use Buzz immediately on the mobile web if you’re using an Android phone or an iPhone. The reason they’re singling out those two phones is that their HTML5-compatible browsers support location. Location is a big component of Buzz on the go because Google not only want users to update their statuses, but to tag them with where they are when they leave it. And while Google has its own location app, Latitude, Buzz works a lot more like Foursquare in that you select places to say where you are rather than a specific coordinate. 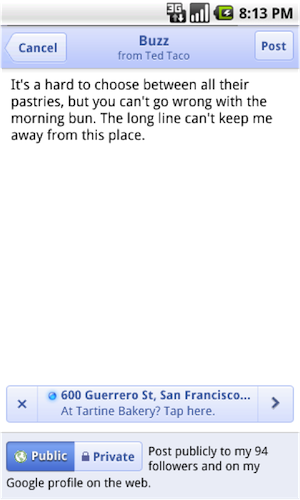 This is an extension of the Places pages in Google Maps that were launched late last year. The use of Buzz alongside these locations make them ever more powerful. You can search to see only the Buzzes written from certain places, for example. Buzz will also work within the Maps app on certain phones (such as Android phones, but not the iPhone — at least, not yet). And it will work inside the Google Search apps on the iPhone and Android. Perhaps the coolest thing about that is that you can use the voice search functionality to speak your buzz update if you just say “post buzz” and then say your buzz out loud. Some big question marks remain for Google. First of all, one big reason they’ve flopped in the past with social implementation is because they seemed to have fundamentally flawed views about what a social graph should be. For example, when they first tried to make Google Reader more social, they automatically ported over your Gmail contacts to give you friends. The problem with this was that they auto-chose people who you were in contact with often based on emails and IMs. But in some case that may be your boss, or someone else that you’re not actually friends with. With Buzz, Google is giving users more granular controls for friend settings, but they’re still suggesting people based on your Gmail social graph, which may or may not reflect your actual desired social graph. Also, believe it or not, there are plenty of people without Gmail accounts. Are they going to sign up and start using an email service just because of Buzz? People certainly haven’t started using Yahoo Mail just because it added social features. Another problem Google has had when it comes to social elements is that they’ve never really had one place to let users share all their social data. Now they have that with Google profiles, which apparently, Google Buzz will be built into. Still, because Profiles are separate from Buzz in Gmail, it might be a little tricky for some users to figure out. Speaking of complexity, overall it’s another issue that Google Buzz may run into. Twitter works because it’s so simple, if you have a public account, your tweets go to anyone who is following you. Buzz is not that simple. There can be public or private buzzes. The plan is to also have buzzes for enterprise and educational users. In those cases, public buzzes may only be available within your company or school, while private would still be private to other individuals in your network. You can see how the social graph is starting to get a little more complicated. Another thing is if someone comments on one of your buzzes, it will leave the Buzz area of Gmail and go into the Inbox area of Gmail, so you know someone is talking to you. That actually sounds pretty cool, and even better, you can reply right from there (another feature taken from FriendFeed), but I could also see that getting a bit confusing for some users. Without having had a chance to play with it yet, it would seem that the core idea behind Buzz is to take on Twitter and Facebook as the easiest way to share content online. Google is offering a number of compelling features such as smart curation (it gets better as you tell it what you like and what you don’t), and a rich mobile experience including location. Because of the features it adds on to what Twitter does, and its overall look, it’s hard not to compare Buzz to FriendFeed. That service was arguably the better product than Twitter, but never took off in the same way for whatever reason (though I would argue that simplicity was a big factor). You could say the same thing for Twitter rivals Pownce and Jaiku (which Google actually bought) in the past. But by adding it to Gmail, Google is giving Buzz a great weapon to succeed where all of those others could not. The big question is: will Gmail users buy into this quick sharing? Google thinks so because it’s a part of the evolution from email, to IM, to status updates. 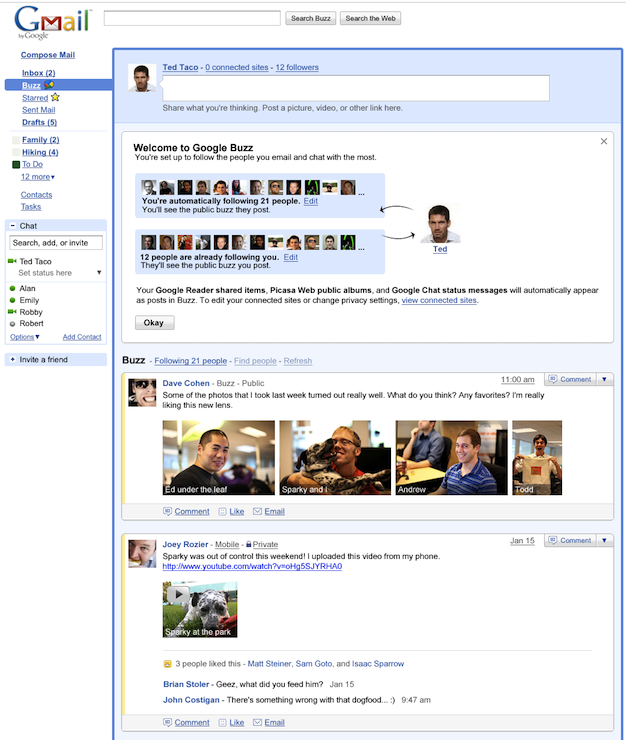 It’s also, in their eyes, a part of the evolution to the next step, Google Wave. So far, the public has proven to be not ready for Wave yet. But Buzz might be the perfect tool in getting people to think about communicating in a way beyond email and IM. Or it may be another misstep in Google’s social quest.